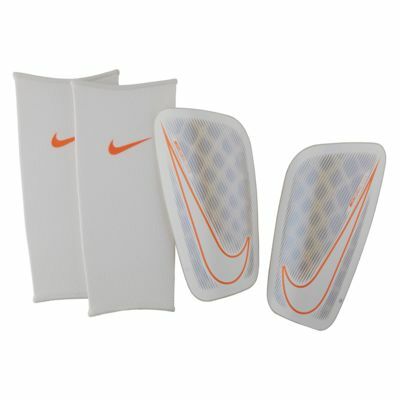 The Nike Mercurial Flylite Shinguards feature a flexible shell to help guard against impact. Materials: Shell: 60% nylon/40% thermoplastic elastomer. Sleeve: 65% polyester/19% rubber/16% elastane. These shin guards are some of the best shin guards I have ever worn, they're unbelievably flexible but strong at the same time and during my matches, I can't even feel them in my sock. One of my best purchases. I scrubbed my shin pads after my Sunday League game and left them on a towel to dry on my radiator. I noticed the next day the heat had caused the plastic to distort and melt away some of the adhesive bonding. They are expensive and I thought they would be a little more robust, which is a shame as overall they are good shin pads.